How well do we actually see the places where we live? Truly notice the details that give it identity and make it a place? For me, the answer is: Better now than when I was young. I’ve lived long enough now that the stomping grounds of my youth have changed a lot. But back then my inner historian, preservationist, and photographer had not yet awakened. I had not yet learned to see. 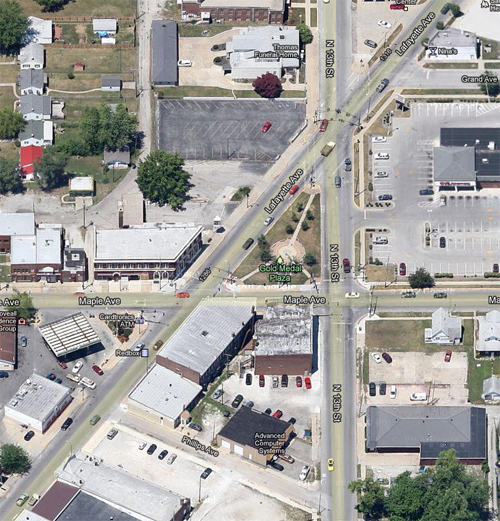 In the early 1990s I lived in the Terre Haute, Indiana, neighborhood known as Twelve Points. The area got its name from the awkward intersection of Lafayette Ave., Maple Ave., and 13th St., which created twelve corners. Twelve Points was once a hot spot, at a time when Lafayette Road was still US 41, when passenger-train and streetcar service still delivered hundreds of people each day to shop here, and before the big shopping mall was built on the south side of town. When I moved there, Twelve Points’ best days were already well in its past. Many of the buildings were empty and in poor repair. A handful of businesses remained. I used to walk over to Hook’s drug store to fill prescriptions, and I’d sometimes stop at the little IGA grocery store on the way home from work. I could have done my banking, gone out for pizza, gotten my hair cut, and visited the dentist in Twelve Points, too, but I never did. Today I’d do it on principle, but that’s the kind of man I’ve become only lately. A few years ago I visited an exhibit at the Indiana Historical Society that made me deeply regret not getting to know Twelve Points better. Part of the IHS’s “You Are There” series, the exhibit recreated Citizens Grocery, owned and run by Ernest Zwerner on Lafayette Road in Twelve Points, as it had been in 1945. It was a painstaking recreation based on 1940s photos of Zwerner’s store (one is here), with period equipment and goods both real and carefully reproduced. Actors portrayed the shopkeeper and customers, all dressed in period clothes. Visitors to the exhibit could go inside the store and talk with the characters, who responded as if it were really 1945 and they were going about their daily business. It put visitors in touch with a time few of us knew. Remarkably, I knew a couple who would have shopped at Zwerner’s: My landlords, Steve and Henrietta, who had lived since the 1930s in their home a few blocks away and rented its attached apartment to people like me. Inside the recreated grocery, I imagined young Henrietta there doing her marketing. Or, more likely she phoned in her order and waited for delivery. I became a little misty eyed as I experienced my connection to this store and this time. I wanted to play along with the actors, tell them I lived a few blocks away on 8th Street (which I had, 45 years later), lament rationing, and ask them how much longer they thought we’d have to fight in this war. But I lacked the guts. I walked around the store in silence, slightly dizzy in delight, the corners of my lips curled up in a slight grin that I tried to suppress lest it let the mist in my eyes get out of hand. 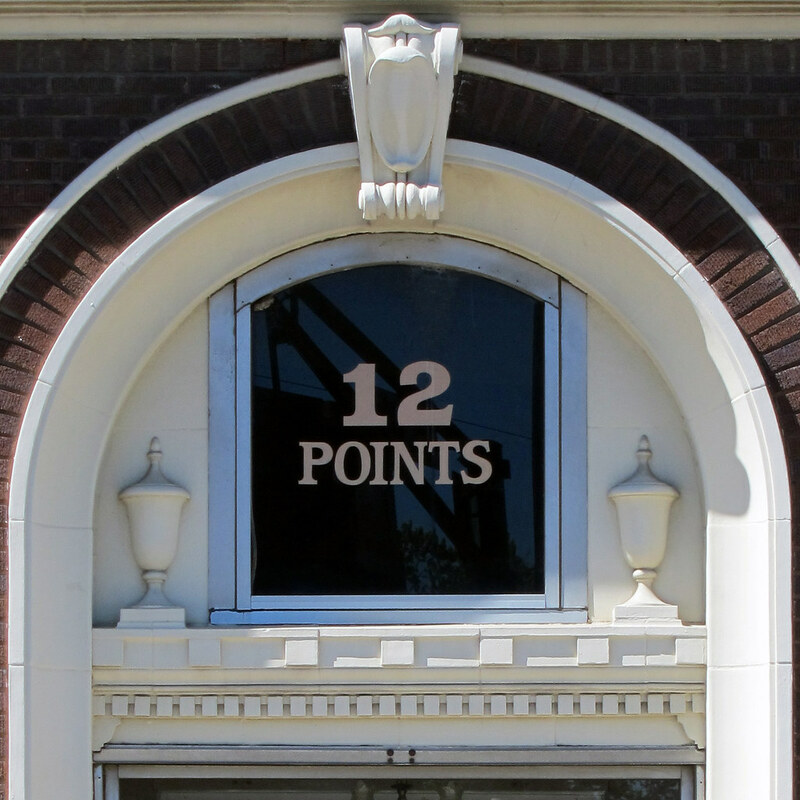 When I last visited Terre Haute, I made a point of returning to Twelve Points with my camera. The building that held Zwerner’s store was demolished decades ago, so I photographed the buildings I remembered from my time living nearby in the early 1990s. 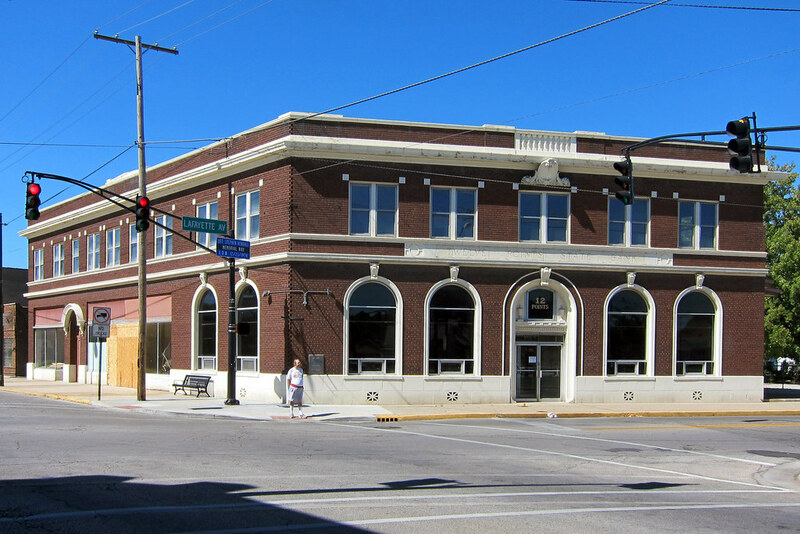 The Twelve Points State Bank building held a branch of the Merchants National Bank when I lived there. It looks pretty good yet, despite the boarded-up storefront there on its south side. Thirty years ago this building was in such poor condition as to be derelict. While it still shows some rough edges, it’s in much better condition today and on the day I took this photo was significantly occupied by Tilford’s Variety Store. Unfortunately, Tilford’s struggled to make its way and closed shortly after I visited. This was the Garfield Theater, which I’m sure was a focus of the local night life. 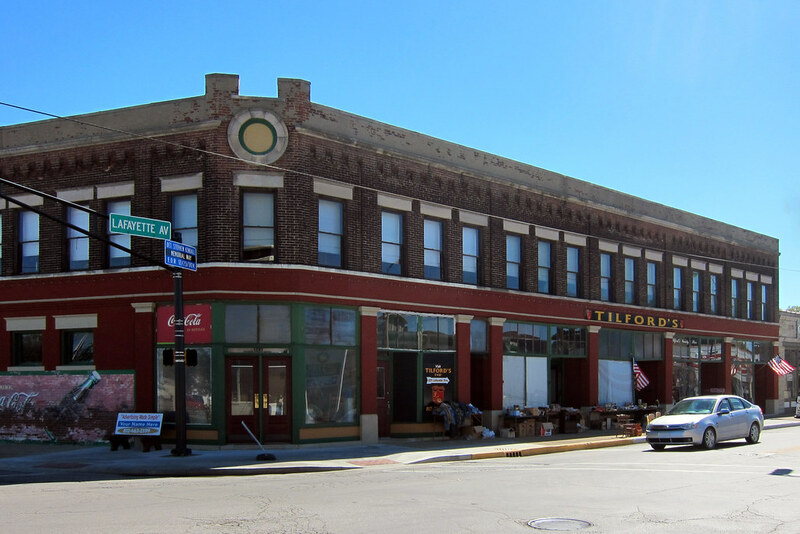 Many Twelve Points businesses and buildings have Garfield in their name because of the former Garfield High School, which once stood around the corner on Maple Ave. 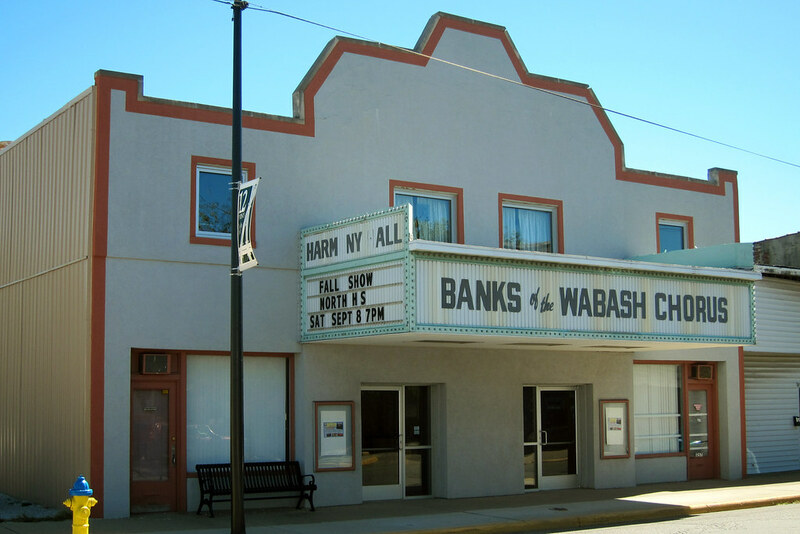 The Banks of the Wabash Chorus, a barbershop harmony group, has been in the building for at least a quarter century. I can’t believe that in the five years I lived nearby, I never ordered a pizza from A Ring Brings Pizza. The now-me shakes his head at the then-me. And now nobody can call C-5951 for pizza anymore, not because C became 232 when seven-digit dialing arrived, but because the restaurant is closed. At least its great sign remains. 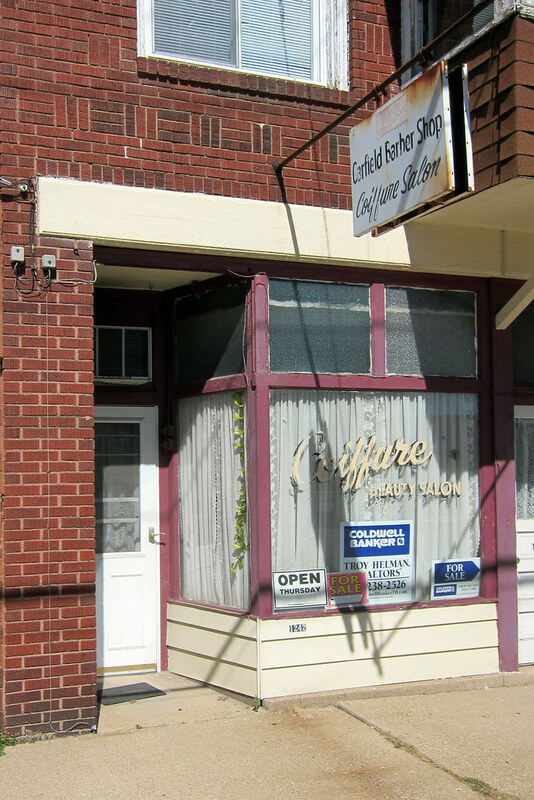 The Garfield Barber Shop and Coiffure Salon is also defunct. I swear that the sign and the lettering painted on the window look just as they did 25 years ago. Since I moved away, a new gas station was built on the southwest corner of Maple Ave. and Lafayette Ave., and it was hopping while I visited Twelve Points that day. A CVS Pharmacy replaced the little grocery store on the northeast corner of 13th St. and Maple Ave., and it showed every sign of doing well. These kinds of businesses aren’t enough to reinvigorate Twelve Points on their own, but they at least show that there is some life left in the neighborhood. Here’s hoping it finds revitalization one day. I first shared these thoughts in early 2013. 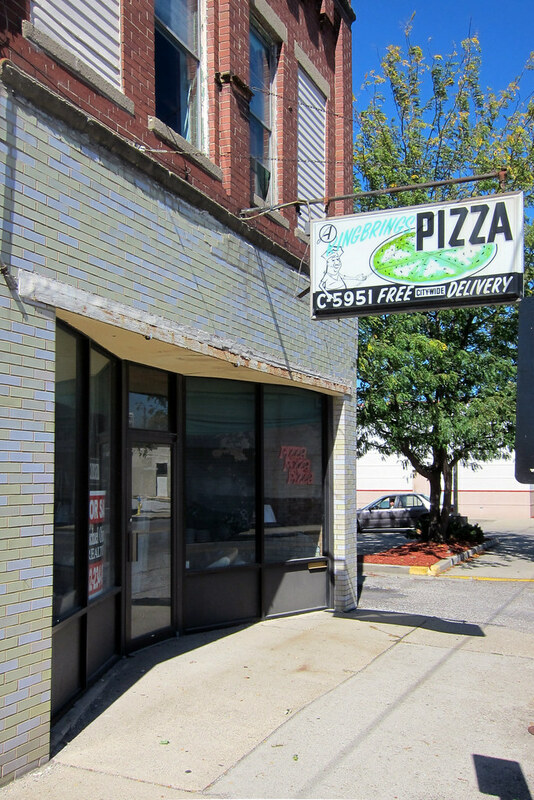 In the 4½ years since, according to Google Street View, a few things have changed: the defunct Garfield Barber Shop has finally been replaced with a new tenant, and the A Ring Brings Pizza sign has been taken down. Tilford’s is still closed, but the men still sing at The Banks Of The Wabash Chorus. If you’d like to see my apartment near Twelve Points and hear my story of getting started as an adult, it’s here. I am surprised at you, Jim. Nobody dialled C-5951 for a pizza. They dialled Crawford 5951. Did you know that there is a database of those old alphabetical telephone exchanges online? Neither did I until just now when I had this horrible need to know what the C stood for because those old phone number prefixes have fascinated me since I was a kid. Except that they did just dial the C! 2-5951 was the actual number! Telephone history fascinates me too. In my Grandma’s small town (Paulding, Ohio) everyone was on the same exchange so a phone call required only dialing 4 numbers. I think that went away in the early 70s. Yeah, the old mechanical switches generally allowed four-digit dialing within an exchange. In a museum I saw a rotary phone that was hooked up to a functioning mechanical switch, so you could dial and see it work. Fascinating, I think it was in the Science Centre in Toronto. Great buildings in twelve points, reminds me of Barton Street in Hamilton which was the shopping hub of the city before the malls came. Hamilton had forced amalgamation of the decaying city centre with the affluent suburbs about 20 years ago. People complained bitterly, and although we now have higher taxes with less service at my house (in the affluent suburbs) it has done wonders for the city core. Overall I’d say it has been worth it. I look at Indianapolis’s affluent suburbs and all the infrastructure improvements they keep making and all the new construction they keep enabling, while Indianapolis struggles to pay for ongoing maintenance of what it has. And then I watch the clogged Interstates every morning full of people leaving their affluent suburbs to work in Indianapolis. It makes me want to enable Indianapolis to tax the crap out of such people. 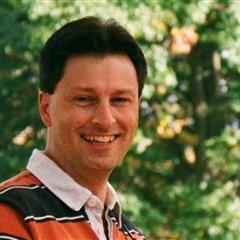 Jim, this is the type of article you write the best…great entry in the blog! I recently went back to my neighborhood on the north side of Chicago, around Wilson and Clark, and t actually never looked better, with a lot of the old buildings still left. My block still had nicely kept courtyard apartments (with rent for 850 a month). Still thinking about moving back…. Thanks so much Andy! I haven’t had time for thoughtful articles like this in a while. I miss writing them. Jim Grey, I lived in 12 Points at 1258 1/2 Lafayette Ave from 1940 to 1959 when I got married..Lafsyette Ave was my front yard and all the shopkeepers were my neighbors snd they all knew me because I was in and out of most of them on a daily basis until I started school in 1944 at Sacred Heart…we shopped at Zwerners market and visited with neighbors over an ice cream sindae at Owl drugstore…I watched the world go by from our front window..I sat on the curb as Semis rolled by….when Lafayette was Rt 41 ! My “growing up ” home is now a parking lot acrosd from the Garfield theatre…So many memories of that time! WWII and the blackouts..food rationing and my brother off to War when I was 4…and my sister working in Evansville making P47 Thunderbolt airplanes at Republic Aviation….so I was very aware of the War…My Mother and I couldn’t wait for the newspaper to come on the day ERNIE PYLE’S column was printed…it was like a letter from OUR soldier boy writing of the day to day goings on over there…..Have you read his books? Thanks for the memories..
Rita, I am just delighted that my memory of Twelve Points connected with you today. I’m very happy that you shared some of your memories of growing up on Lafayette Avenue and especially of Zwerner’s store. When I lived a block south of Collett Park on 8th St. in the 1990s, the very nice couple who rented to me had lived in the front part of that house since they married, which was about 1935. I wish now that I had asked them to tell me stories about their lives during the Depression, WW II, and the postwar years. I’d love to know them. Sadly, they’re both gone now.